Taking every opportunity to grill this summer has taken the Hubs and I through endless sides. Grilled corn, really any veggi I can grill I will & have! So we wanted to try something new. Why not try a new twist on a pasta salad, except using israeli cous-cous in lieu of pasta. It turned out soooo good! This salad was light, bright and full of flavor! 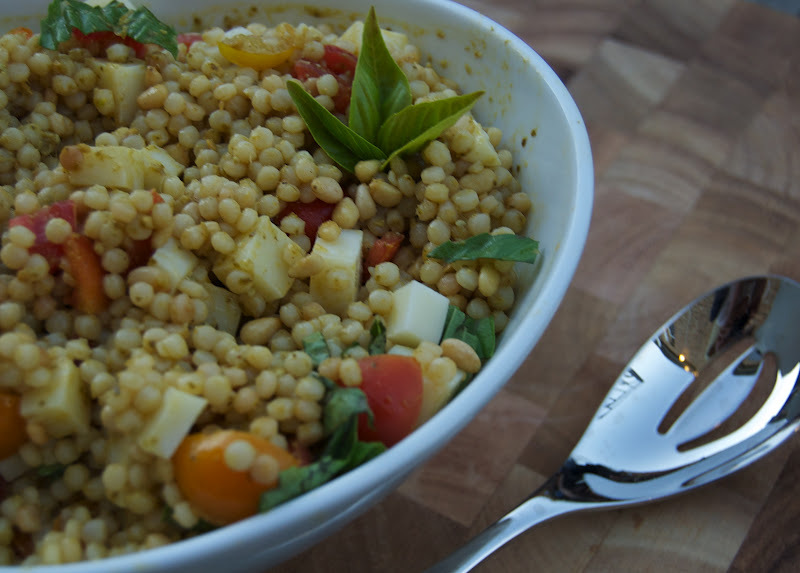 Pesto plus elements of a caprese, and then pasta-like Israeli cous-cous. Yum YUM! I loosely followed this recipe, we omitted peas, and I used a low-fat firmer skim mozzarella. Already imagining trying this again with feta, and olives for a mediterranean twist (maybe served alongside grilled lemon chicken). Have you tried any new great sides this summer? Anything with pesto is pretty much my most favorite thing ever. It was sooo easy to make! You should totally make it! Oooh did someone say PESTO???!!!! This looks pretty good! I wish I could eat carbs right now so bad. You have NO idea. Yum! It looks so good my friend. I think you should do this type of combination for next time: http://www.dailydishblog.com/2012/07/greek-pesto-pasta-salad_09.html In fact, I may steal this idea. 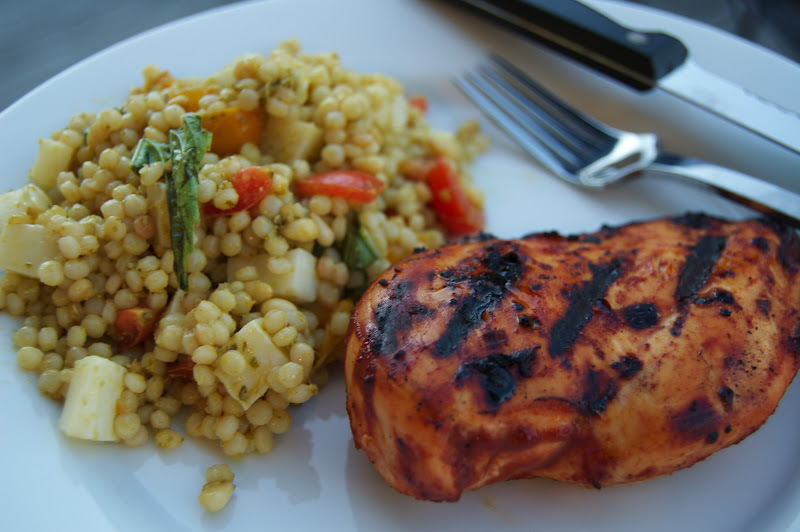 I've been wanting to make Israeli couscous for the last few weeks. It's so good. That combo would be DIVINE!!!!! So going to make that! That salad looks so good! 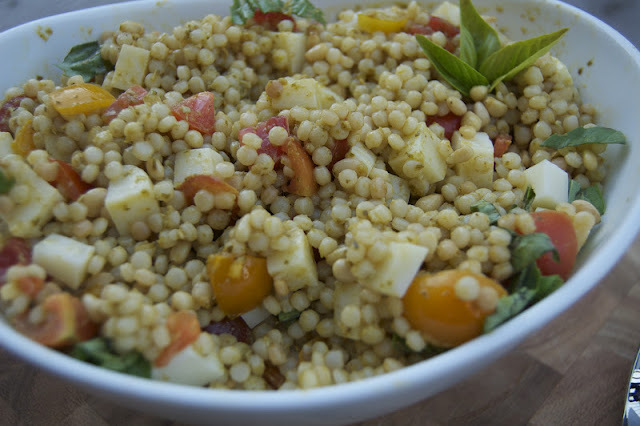 I've been experimenting with quinoa a lot lately...if you haven't tried it I would recommend it! I love quinoa, it is a staple in our house!! !